BEFORE uploading media files for the transcription and captioning service check, and if necessary update, your Transcription Settings. At the time of upload your files immediately take all current settings and these settings cannot be reconfigured once submitted so it is best practice to always do this before uploading. Please note: Transcription Settings are a project-level setting and not a user-level setting. Any changes you make will be applied to your project and could impact other users! 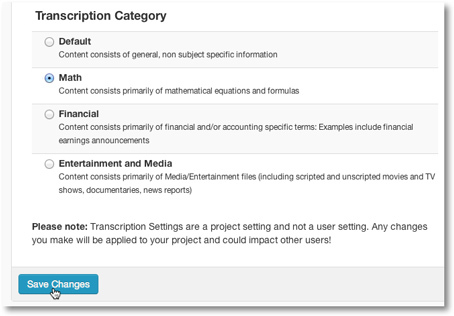 To view your project's current transcriptions settings click Settings followed by Transcription Settings. There are three components to your Transcription Settings. 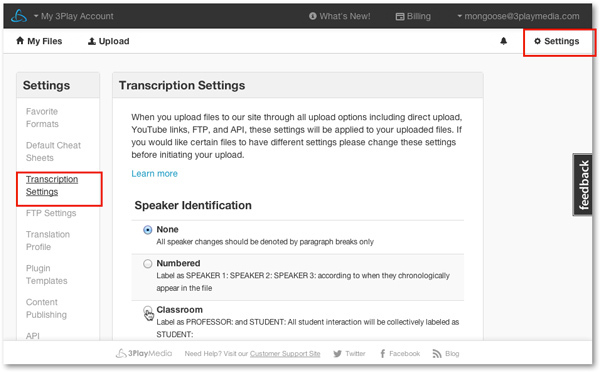 Under the Transcription Settings you can change the way your speakers’ IDs are labeled within your transcript and/or closed captions. MODERATOR: The person who introduces speakers. The moderator is NOT the main speaker giving the presentation. UNIDENTIFIED CO. REPRESENTATIVE: A spokesperson for the company, who is delivering information or answering questions. UNIDENTIFIED PARTICIPANT: An analyst or media participant, usually asking a question. UNIDENTIFIED AUDIENCE MEMBER: Any person whose status you cannot otherwise determine. Entertainment and Media: Speaker identification for Media/Entertainment files (including scripted and unscripted movies, TV shows, documentaries, and news reports). Custom: Note: Only select custom if you have already communicated custom speaker identification instructions to a 3Play project manager. Once you have logged into your 3Play Media account, click here to view the different options for labeling your speakers. Here users have two options for flagging their transcription. The choice is between Standard or Clean flags. The Standard Editing Flags setting will use [INAUDIBLE] for words that cannot be understood and [?flagged word?] to denote words or proper nouns that cannot be confirmed. The Clean Editing Flags setting will replace [?flagged word?] with either the editor's best guess or [INAUDIBLE]. Clean Editing Flags will leave no flags when finished. Financial; for content containing primarily financial and/or accounting specific terminology. Entertainment and Media; Speaker identification for Media/Entertainment files (including scripted and unscripted movies, TV shows, documentaries, and news reports). PLEASE NOTE: If changes are made to your transcription settings be sure to click Save Changes before navigating away from this page.